Ah! Ufff!. What an eye opener. Easily the best Praja meeting of all. I am so lost for words here. So would be IDS, Murali, Naveen and Manjari you bet. Otherwise, we would have logged in our reports yesterday itself. IDS took the train from Hebbal. Naveen, Manjari and myself got on to it at Belandur station at 7:10. Murali sir joined in near Sarjapur Road at about 7:20. We were at Hosur station by around 7:50. Had our morning coffee there as the engine changed ends. Return ride started at 8:10 am. 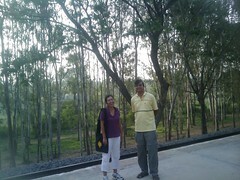 We were back at Belandur station by 8:45 or so. Need to check with IDS and Manjari when they reached Hebbal. But all in all, after watching clean and empty train, and nice little stations, all so close to the busy corridors and suburbs of Bangalore, we were all wondering why, why is it that this magnificent option is sitting underutilized while we all debate public transportation!? Anyway, here are the pictures. 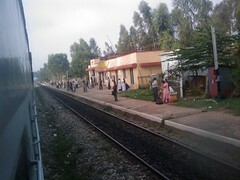 The Belandur Road station. 1 km from Outer Ring Road, tiny, sleepy, more like a picnic spot right now. Stone's throw from Cisco office. There was no one around to give us our tickets. But the counter opened by the time train arrived. 6 Rs per person for a ride till Hosur. IDS paid Rs 10 Hebbal to Hosur. How much would you be willing to pay for a comfortable smoke and traffic free ride from Hebbal to Hosur? Rs 30? 40? Murali joined us at Karmelaram, right next to Sarjapur Road, not very far from Wipro campus, and the sub-urban area building up around it. Heelalige station, seemed very close to Hosur Road. Missed taking pics at Anekal Road, but here is crossing Hosur Road. At Hosur Station, ordering our morning coffee. We did ride with tickets. Damn cheap by the way. Though I wouldn't mind paying more for more modern and reliable services, would you? Not many trains at the stations we crossed, had ample space around the tracks for potential track doubling work. And buildings crowding around Hosur Road corridor were visible all along our ride. So here it is folks, a story yet to be told and explored by our city. Reminds me of that famous sanskrit saying about the deer (Mriga) and Kasturi. PS: Here is the exact route of the CRS test ride reported above, a detailed map, from Hebbal to Hosur, with all the stations pointed out. See for yourself, how this route can serve job and residential areas around Banaswadi, Outer Ring Road, Sarjapur Road, Electronics City, Jigani/Anekal and more. Submitted by idontspam on 9 May 2010 - 12:44pm. Train arrived in Hebbal on time around 6:35. On return there was a slight wait at Banaswadi and reached Hebbal by 9:40. The last mile was circuitous and the solutions for Hebbal is here. Tension free ride. Will always reach on time unlike road traffic. Has huge potential to scale to a full fledged commuter rail service (CRS) with last mile connectivity, extension of service to other places like Tumkur, Kengeri etc, track doubling, increased frequency in that order. We will tackle these in other posts. Submitted by zenrainman on 9 May 2010 - 4:08pm. Submitted by Naveen on 9 May 2010 - 5:50pm. SB & IDS have already included many pictures in their descriptions of the train between Yeswantapur & Hosur. So, I do not want to repeat the same pictures & the ones below are those that are not duplicated elsewhere - I think ! Pranav & Manjari waiting at Bellandur station. Train passing level X-ing at Karmelaram. A luggage section is included on the train - a scooter was loaded in after payment for luggage. Submitted by kbsyed61 on 9 May 2010 - 7:40pm. I have been little out of action for couple of months. Back and trying to get active again on Praja. Hopefully I can find something that I can contribute from Off-site. Thanks for taking the initiative and riding the CRS. From Hebbal to Hosur in less than 90 mins is really amazing travel commute choice. I don't think any other mode of transport can beat that. Guys, can you identify the high density Office/industry areas this train passes By/through? SB mentioned Cisco and Wipro campuses. Let us continue the efforts on CRS and make it a viable commuter choice in Bangalore. My worry is due to no publicity and no strategic marketing, SWR might be tempted to discontinue the service. Start would be to discuss and list the advantages that this train brings to the city, companies and localities that can make use of. Meeting with SWR DM to discuss and show the support for CRS would be a good beginning too. Also encourage people to take CRS on Bus Day would be one idea to explore. Submitted by idontspam on 9 May 2010 - 8:10pm. The scooter was offloaded at Banaswadi, If one carriage was made available for cycles the last mile will become a non-issue for a great majority. can you identify the high density Office/industry areas this train passes By/through? SB mentioned Cisco and Wipro campuses. Manjari made a good point, there are a lot of colleges we noticed along the way. For the kind of price points YH1 offers, add a cycle carriage and you have converts in colleges. Was trying to spot Colleges on a map, maybe this is some offline work? Submitted by murali772 on 10 May 2010 - 12:10pm. It's Karmelram stn (the picture confirms it) as different from the various spelling versions in the earlier postings by others (Perhaps comes from the Carmel convent in the vicinity). The station is just about 150M from the G3 route, branching off (to the left, facing Sarjapur) some 100M before the level crossing. The fare from Karmelram to Hosur was just Rs 5/-. The Helalige station, the first stop after Karmelram must be just about 1 Km from Narayana Hrudayalaya. So, if I were to be commuting on a regular basis to Hosur, Bommasandra/ Jigani/ Attibele Indl area, the fastest and cheapest mode for me would be to take the G3 from Koramangala to Karmelram, and then catch this train. Of course, the connectivity at the other end is perhaps a question mark presently. Whatever, this commuting option certainly holds great potential. Submitted by rs on 10 May 2010 - 2:38pm. This is really great - I hope the train idea survives - and this doesnt go the way of the HopOnHopOff move. I would be very happy if they introduces a southbound train - from Hebbal to Kengeri or some such thing. I commute from Malleswaram to Jnanabharathi - and it would be very convenient for me to go by train. Submitted by manjari on 10 May 2010 - 4:04pm. I was told I am pushing it, maybe I was pushing it a bit as well. I was picked up by Pranav and Naveen at 6:45am near Kadabeesanahalli. We went to the Bellandur railway station and honestly I was a little ashamed that I didnt even know its location even though I work and stay on outer ring road. Most of the exciting parts about the trip have already been covered in the above posts so I will jump directly to how I made it to the movie. After an interesting conversation with IDS, I got off at Banaswadi at 9:30, took an auto and rushed to the theater and was there at 9:55 for a 10am show. I went from Bellandur-Hosur and then Hosur-Banaswadi in Rs 16 in a span of 2 and a half hrs without being stuck in traffic without people honking and without all the smoke. I wouldnt have felt bad had I missed the movie because the train trip had already made my day. Submitted by silkboard on 10 May 2010 - 4:28pm. More from Belandur Road station, interestingly code named BLRR which is a lot more like bangalore than Bangalore City (SBC) itself! Our train's information board - headed for Devanahalli on return !! Submitted by rameshk on 10 May 2010 - 5:34pm. Recently, we had to commute to Lingarajapuram (reach by 10 am) for around 10 days. As I was hooked to the CRS news (almost read every bit of related news presented by google searches and also all related discussions/news on praja.in), I was more than eager to try it. Though I personally never took the train, here's how my family used it. The train trip to Banaswadi took hardly 10-15 minutes. Not so lucky in the return journey (no CRS train until at least around 4 pm) in the afternoon and it was an ordeal (BMTC + Auto) which sometimes took 2 hours but waiting for bus in the hot sun with no shelter (unlike railway station) was not very pleasant. Add to it the crowds (even in the Volvo bus). The frequency of the service needs to be made at least hourly for it to kick off in a big way. And timeliness is a BIG concern. Submitted by vinay_sreenivasa on 10 May 2010 - 7:53pm. this is great work! great report. can i also suggest you mark this on a map? that way we can share this with a singla image - the cost, time, route etc and use it to popularise this. maybe you should suggest the railways to have a train day to popularise this!! Submitted by kbsyed61 on 10 May 2010 - 8:26pm. One way to bring some convergence on support to CSR would be by organizing a seminar/workshop on CSR with all the stake holders presenting their side of the story. Panal should include representatives from Railways, BMTC, BBMP, MLA/MPs, Transport experts, BCIC, Industry/Companies and Public. Let me know if anyone would take the lead on ground. It will be an wonderful opportunity to publicise PRAJA, making inroads into railways as well. Submitted by silkboard on 10 May 2010 - 10:54pm. This is not done very well - a thick line overlaid on top of a scanned city map. But it gives you an idea of the reach commuter rail network can have in Bangalore, and how it integrates with other modes of public transport. As for the exact route we took for the CRS test ride reported above, here is the detailed map, from Hebbal to Hosur, with all the stations pointed out. See for yourself, how this route can serve job and residential areas around Outer Ring Road, Sarjapur Road, Electronices City, and Jigani/Anekal and more. Submitted by vinod_shankar on 10 May 2010 - 11:35pm. Submitted by vinay_sreenivasa on 11 May 2010 - 11:31am. we should work to popularize this. btw, does anyone have any idea of the capacity of these trains? Submitted by manjari on 11 May 2010 - 11:48am. From what I read in one of sanjeev's posts it said that "Each coach can seat a maximum of 110 passengers. So, over 500 passengers can commute on each trip"
I know there were 6 coaches. Submitted by s_yajaman on 11 May 2010 - 11:49am. Great stuff. Imagine having a train like this every 30 minutes from Kengeri to YPR or Whitefield. If the powers that be are serious about decongesting the city they need to pursue this. Also looking forward to 2013 when the Phase 1 of Metro come online. What a pleasure it would be knowing that you can reach MG ROad from Jayanagar in 25 minutes exactly day in and day out. Submitted by idontspam on 11 May 2010 - 4:11pm. does anyone have any idea of the capacity of these trains? These rakes are just a stop gap arrangement. 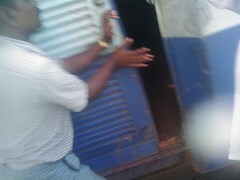 We cant let CRS run on these rolling stocks in the long run. The potential lies in a regular commuter rail type rolling stock. Submitted by Sanjeev on 11 May 2010 - 8:20pm. I really missed due to the meeting in the office. This way, we at Praja are giving much needed publicity for these Local Trains. Photos are really good and give very good impression on the stations and Train. If SWR starts these trains from Kengeri, the ridership will really will go up. This Local Train from Yesvanthpur to Hosur will really help lot of commuters if they improve upon the timings and align with office timings. Sr No Train No From Station Dep To Station Arr. I have seen many IT guys travelling from Hosur to Belandur by these Local Trains working in WIPRO / CISCO. As mentioned by others, Timing and frequency with last mile connectvity are the key factors in success of these CRS. 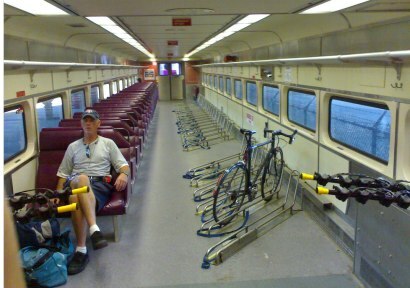 We should have Commuter Rail Day. This we can do it by giving good feedback to DRM of SWR Bangalore and writing letter to our MoS Railways Shri K H Muniyappa and MD of BMTC. Comprehensive report on CRS ! Submitted by kbsyed61 on 11 May 2010 - 8:54pm. Thanks for publishing the timings. Moving forward to support CRS, we may need to do some ground work to compile a comprehensive report listing the benefits that we can reap from this service and the missing items specially the low hanging ones that civic agencies can easily provide. There is ZERO info available on Railway Websites on Bangalore CRS. If somebody can provide me the links or data, I can prepare the report that can be submitted to DRM, MoS Railways and all the stakeholders. Vicinity information for each Stop/Station - Nearby areas, companies, Schools/Colleges, Hospitals etc. List of missing/needed amenities at each station including signs, parking, nearby bus stop/service etc. Did I miss anything? Pls free to add more to the list. CRS Exclusive pages on Praja! Submitted by kbsyed61 on 11 May 2010 - 9:08pm. Do you think it will hep CRS publicity with Praja hosting CRS exclusive web pages with passenger information like Route, Stops/Stations, Timings and some local directory etc? I think it will. It can be similar to the Bus Day pages with its own banner and downlaodable information. Praja TECH, would you support this? Submitted by hmajay on 12 May 2010 - 12:31am. To make public aware of t he local train service, the local train should be marketed just like the Bus day. The bus day ad'sprobably should have Train service. Buses can provide the services to final destinations from the train stops. Submitted by manjari on 12 May 2010 - 10:12am. I agree with Syed, it would be a good idea to collate all the information we have on a page which is easy to access and easy to read. But I also think it is something that the SWR should do. We could help them in case they want but honestly it is more effective if they put their man hrs in it. Submitted by manjari on 12 May 2010 - 10:21am. I have setup an event for a meeting next Saturday so that we could all meet and decide on what needs to be done for publicizing the train. Submitted by Sanjeev on 12 May 2010 - 12:15pm. Its really good idea to have CRS exclusive web pages in Praja and provide big publicity along with Bus Day / Public Transport Day..
We should help SWR officals in bringing out more publicity, they may be reluctant to do that . Also BMLTA & IDD are co-ordinating with Railways for the Local Trains, but not much progress. I tried to meet IDD Chairman Mr V Madhu few weeks back, but he is very busy in the HSRL propsal clearance ( we all know for what reason this project is given high priority ) and did not give an appointment to meet even after several follow up with his office. We should put all our efforts in publicity or either meeting SWR DRM, MoS for Railways Shri K H Muniyappa, BMLTA Director, co-ordinate with BMTC Director to provide feeder service to local Trains or ensuring BMTC buses are allowed inside SSC, Yesvanthpur Stations, MD of NAMMA METRO for better integration at Yesvanthpur Station, Mysore Road Station and Byapanahalli stations. Submitted by tsubba on 13 May 2010 - 4:36pm. two key things. ids's cycle car. syed's mapping sinks and sources around stations, add synchronize bus & auto services. hyderabad killed its crs bcoz they could not get their city buses to sync with their city trains. Submitted by n on 13 May 2010 - 6:41pm. Very nice report. Sad about the lack of good feeder service. Submitted by gopi on 18 May 2010 - 5:51pm. This is a wonderful eye opener for most of the people of bangalore who does not know that the time taken between hosur and bangalore can be so less. If people start using this facility and create more awareness and in turn demand for more trains on this route, the bangalore - ITPL - electroncity - Hosur corridor can be accessible by the public very easily. Submitted by shyamm on 9 July 2010 - 10:17am. Is there any trains from Yesvantpur to Whitefield ? Could DEMUs be introduced from Yesvantpur-Hebbal-Banswadi-Byappanhalli-Krishnarajapuram-Whitefield? or from Bidadi-Kengeri-Jnanabharti-nayandahalli-Bangalore City -Cantonment- Blore East--Byappanhalli-KR Puram-Whitefield itself? Whitefield station is just a couple of kms away from Salarpuria GR Tech park-Brigade tech park-ITPL and host of IT companies near Sai baba hospital? BMTC could introduce shuttles between Whitefield station to these above mentioned office blocks. 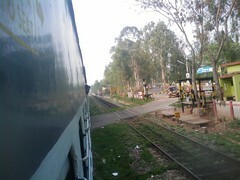 Submitted by Sanjeev on 15 July 2010 - 11:25am. Already the above segments are completly electrified and Railways can run EMU trains only now itself without waiting. Yesvantpur-Hebbal-Banswadi-Byappanhalli-Krishnarajapuram-Whitefield and Bidadi-Kengeri-Jnanabharti-nayandahalli-Bangalore City -Cantonment- Blore East--Byappanhalli-KR Puram-Whitefield are completly electrified with double tyrack except single track between Yesvanthpur to buappanahalli. This will not only help all IT companies even people who are working in Automobile industry at Bidadi and Pennaya. Govt office like Banks, LIC, Post Office, State Govt Office employee will get benifited. Now all IT Companies, Automobile Manufacturers, Textile companies and other PSU Managment should ask Railways and State Govt to start Full fledge Commuter Rail for Bangalore, METRO, Mono Rail and HSRL will only cover small portion of Bangalore and cost of Commuter rail is one tenth of METRO / HSRL / MONO and even fare will be very low in case of Commuter Rail. Submitted by mohan anekal on 14 July 2010 - 10:05pm. The train and bus services could be integrated. Now that almost every village in Bangalore district is connected by BMTC, new bus routes have to be initiated from the suburban railway stations in association with educational institutions/factories/offices, etc. At Heelelige, Bus service could be run between Heelelige railway station to Silk board, which covers Narayana Hrudayalaya, Bommasandra Industrial area, Electronics city. Similarly, Bus service could be provided betwen Heelelige and Jigani, which serves Narayana Hridayalaya, Bommasandra Indl area and Jigani indl area. Existing service between Chandapur and Silk board/Jigani could be extended up to Heelelige, which is hardly a distance. At Karmelaram, the bus service could be initiated from the railway station upto Silk board, which covers Sarjapur road, Wipro, HSR layout. At Bellandur railway station, service sould be provided from the railway station to Silk board and beyond, which serves the IT corridor along the ring road. In addition, the bus service could be provided from the station to Kadugodi via Varthur. At Anekal, the bus service could begin from railway station as per the arrival/departure of the train up till Shirdi sai Engineering college. The Anekal-Jigani/Bannerughatta/Chandapur trip could begin from the railway station than from the town, as the distance is hardly a km or 2. Educational institutions like BIET, Heelelige, Alliance Business Academy, Anekal, are located adjescent to the railway stations. Another advantage is that, the BMTC depots are very much in the vicinity of these railway stations, and hence the last leg connectivity could be planned to the perfection. I have noticed at Hosur railway station that bus service is provided from railway station to bus stand for a nominal fare of Rs. 3 coinciding with train arrival and departure time, which has to be followed regularly, though. Submitted by K.S.Ramanujam on 15 July 2010 - 3:00pm. The railways have not publiced about such shuttle services, even when every one is crying for good local transport !! All eyes are on;ly on Metro ! If the existing services between Bangalore - Hosur ; Bangalore - Chickballapur , are announced and given publicity , many people will use it and the railways may add more shuttles. Probably we in PRAJA should take initiative and train schedules, cost, and frequencies, days of operation , etc ..on e-mails , the message can spread. Similarly on oyher shuttles. This work may have to be shared with SWR authorites also. Submitted by Sanjeev on 24 July 2010 - 7:22pm. Here you can see the train info on the following link ( this is not Indian Rail website ), but they have updated these 3 CRS Trains of Bangalore latest timings after juky 1st is yet to be updated on this website. Submitted by idontspam on 25 July 2010 - 11:07am. "With the benefit of hindsight and experiences of Peenya, the new industrial hubs will have the following edges: A dedicated feeder line; modern residential township complete with shopping mall, cinema and health centres; access to railway (Bangalore-Pune line passes beside) and NH 4 and proximity to Dobbspet, the large scale industrial hub"
So here is something that is coming up around the existing train line and will be criminal to ignore commuter rail if this is on stream.You can see how planning train commute to this will work better than trying to come up with catch phrases like the walk to work etc. Submitted by psaram42 on 25 July 2010 - 2:32pm. I missed the ride too, like Zenrainman sir. Now that Praja and others have taken up the CRS issue, it looks like that Bangalore too will have the local trains to boot like Mumbai. When compared to the road widening issue this one looks pretty simple, as the existing infrastructure can be used profitably. Submitted by planemad on 2 August 2010 - 2:52pm. i made this chart based on timetable data to figure out which parts of the day had most trains. As you can see there are plenty of trains running on the city-ypr and city-kjm sections which can be utilized by commuters. If there was a little more publicity given to the timings and tickets were easier to buy, this would become a very attractive option. Imagine Majestic-Krishnarajapuram at 6 bucks within 30mins! Submitted by idontspam on 2 August 2010 - 10:28pm. Good work Arun, can you explain what the dotted lines indicate in the graphic? Submitted by baranikumarhtsl on 25 October 2011 - 10:06am. I am primarily located in hosur and by going thru this page got lot of interest to make use of the train facility to commute to office near CISCO office(Intel). Do we have the parking facility in these local stations? Because my office is around 3.8kms from carmelaram/belandur station for which parking facility for cycle/bike is mandate. Submitted by sanchitnis on 27 October 2011 - 5:49pm. PS: I travel daily between Banaswadi and Belandur by YP-HSR train. I will be posting detailed report on this shortly. Submitted by sakthi207 on 23 July 2013 - 9:27am. Thanks for this detailed information what you shared here. I am woking in Koramangala. I was staying in BG Road here. But, there was some need for me to move to Hosur. But, due to travel i was hesitating to do that. The search was ended here. After i saw this blog, i decided to move to Hosur. Now, almost 3 months i am travelling from Hosur to Koramangala.